Rain again today which meant the dog trainer cancelled on me. I was looking forward to that all week. It seems like I am always doing things with my foster dogs and this training is the one thing that I could do with my dog. Hopefully next weekend will be sunny. Another concequence of the rain is that the new dog didn't want to go outside. No dog has ever pooped in my house, until now. He's lucky he's cute. 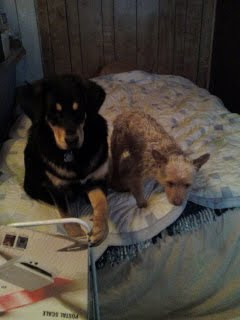 Here are 2 of the dogs supervising my work. 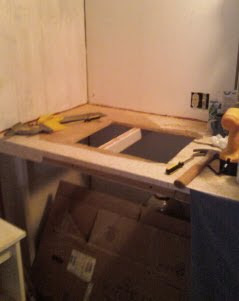 I managed to cut a hole in my countertop for the bathroom sink. I ran in to a few set-backs as usually happens with projects like this. After cutting it out a third of the way my saw blade broke. I could have made a 45 minute trip to buy a replacement but I decided to try some other things like a hammer, chisel, drill and hand saw. Here's where the hole needed to go. Here's the extra sturdy brace I had to cut also. The guy who built this coutertop did an excellent job. It's the best built thing in this whole place. 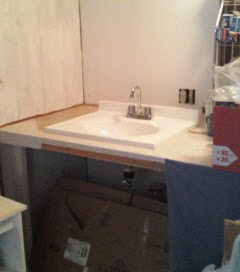 And here's the sink sitting nicely in the hole. 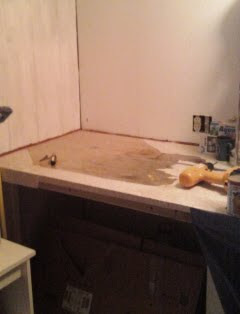 Next weekend maybe I'll get the water line hooked up to it and the week after that maybe I'll get to the drain. This is going very slowly but as long as I am still moving forward it is still progress. So far, so good, and way to improvise. Those multiple trips to Home Depot always add up pretty fast for me when I am working on a project. Luckily, there is a Lowes right next to the Home Depot so if I have to go back multiple times in a day I can mix it up and hope the employees don't recognize me. Looks like excellent progress to me. Well done. I hope your house isnt smelling too bad now! Over the Cubicle, I have the worst luck getting help at HD or Lowe's so I doubt they would recognise me. There is a guy at Ace Hardware who knows me though. If I go back he's gonna say 'you aren't done YET?'. Lizzie, my house is smelling pretty good actually. I started using Spray and Wash on the fabric of the chair and it leaves a nice fresh scent!